Many Notaries have asked questions about the signing script requirement in the Signing Professionals Workgroup Standards announced in October. We’ve answered some of the common questions below. 1. Why is there a signing script requirement in the SPW Standards? 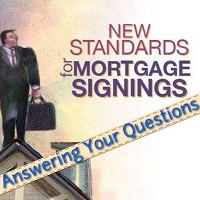 The signing of loan documents is a critical touch point in a mortgage transaction. The SPW published the Certified Signing Specialist Closing Script to help create a consistent customer experience from loan to loan and signing agent to signing agent. 2. Will signing professionals be required to follow the SPW script word-for-word? No, it is a guide. Signing professionals will be expected to substantially follow the script but will not be required to recite it word-for-word. Using the script is similar to guidelines in other industries. Consider airlines, for example. The FAA requires flight crews to brief passengers on in-flight safety instructions, but each airline may choose the style in which it delivers that information, ranging from live instructions by a flight attendant to creative viral videos such as the one produced by Virgin Atlantic here, or Delta Airlines here. 3. Will all lenders, title companies and signing services be required to use the SPW script? A decision to use the SPW signing script is up to each company. For example, if a lender wants signing professionals handling its loans to follow the script, it will write this requirement into its contracts with title companies and signing services. Title companies and signing services will then require the signing professionals in their networks to follow the script.